If Florida is the perfect holiday destination for a summer holiday, then CLC World Encantada Resort is the perfect place to enjoy the holiday. It is a luxury townhome-style resort with award-winning facilities and amenities, which give you the complete experience of a family holiday. The warm and inviting colour tones of the villas complement the hospitality of the hotel staff. There’s a heated zero entry swimming pool, a swimming pool with a Jacuzzi, a game room, free parking and Wi-Fi facilities. 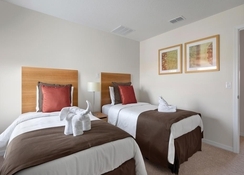 To add to the experience of a complete family holiday, the hotel provides easy access to a multitude of theme parks as well as leisure and entertainment venues in the Orlando area. Surrounded by coconut trees and water bodies, the hotel exudes a tropical vibe. Stroll along the private lake that features a fishing pier, jogging track and walking trails. Or if you’re tired after an action-packed day at the theme parks, relax in the clubhouse, which has enough features to keep adults and children engaged, with games room, arcade machines, pool table, PlayStations, X-Box and cyber cafe. 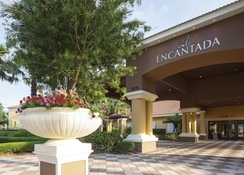 CLC World Encantada Resort is situated in Kissimmee, Florida. 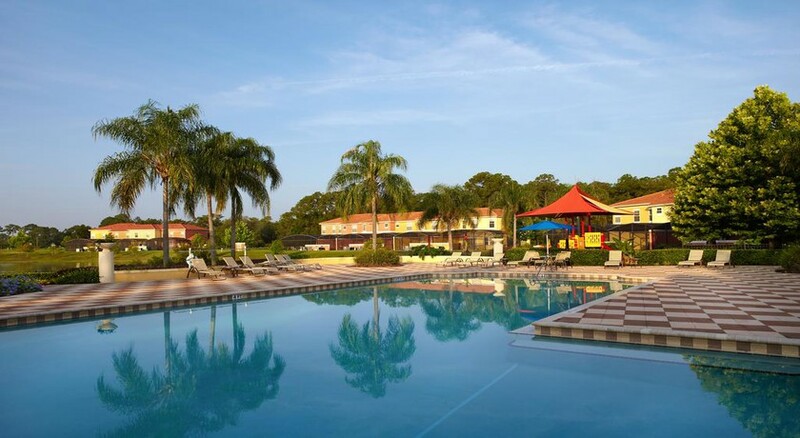 The place is ideal for soaking up the warm Florida sun and enjoy the multitudes of theme parks for which Florida is known. Walt Disney World Resort is just a 10-minute drive from the hotel, while Universal Studios’ resort is a half-an-hour drive. The Orlando International Airport, which connects the holiday resort to the rest of the US and the world, is at a distance of around 33 km from the hotel. If you are feeling a little more adventurous, you might want to take a day trip to Miami Beach. The accommodation choices at CLC World Encantada Resort are perfect for small and large families alike. They come in two varieties: two-bedroom townhome and 3-bedroom townhouse. 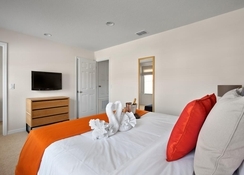 Spacious and tastefully decorated, they come with multiple bedrooms with king- and queen-sized beds, en-suite bathrooms, water closets, outdoor covered patio, living spaces with sofa-beds and a host of modern amenities such as flat-screen TVs, telephone, radio, microwaves, refrigerators and dishwashers. CLC World Encantada Resort’s on-site restaurant Romy’s remains open seven days a week and a poolside bar that has happy hours every day, between 4 pm and 6 pm. The pool bar offers draft beers, cocktails and house wines. The menu of the restaurant is an eclectic mix of salads, sandwiches, wraps, tapas platters, and cold and hot beverages, served during breakfast, lunch, dinner or in-between meals. There are lot of activities to do both on and off property. The hotel organizes special events for families throughout the year. The CLC Encantada Clubhouse is an excellent place to catch up with other guests or play an X-Box game or two. Free Wi-Fi is also available throughout the clubhouse, so that you are never too far away from posting about lovely experience on social media. 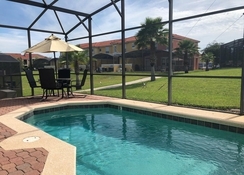 If solitude is what you seek, then relax and soak up the warm Florida sun at one of the many pools of the hotel, which includes a heated zero entry swimming pool and a swimming pool with Jacuzzi. The heart of the hotel is an expansive waterbody, which is the perfect spot for fishing, walking or jogging. Exercise classes are also conducted. The palm-tree-covered lakeside resort is also the perfect place for a holding a wedding celebration or corporate meetings, for which the hotel provides various packages. 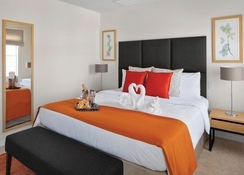 It is also a great spot for corporate travellers, students, sport teams and guests looking for an extended stay.